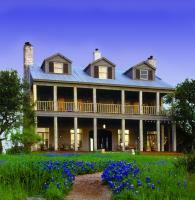 Here are the top hotels for your Texas Hill Country wine tasting trip! Set on 88 acres of countryside beside Onion Creek, this rustic-chic hotel in Kyle, TX is 6 miles from Plum Creek Golf Course and 27 miles from Austin. Polished rooms and suites have fireplaces, sitting areas, and satellite TV, plus DVD players and free Wi-Fi. Breakfast and dinner (included) are served in a country-chic restaurant that offers farm-to-table American fare. There's an outdoor pool, a 14-person hot tub and a fire pit, plus a bocce court, horseshoe pits, and hiking and biking trails. A spa offers massages and beauty treatments. This modern resort complex overlooking Lake Travis is 4 miles from Lakeway City Park and 19 miles from Lake Austin. Stylish, contemporary rooms have lounge chairs and work desks, plus flat-screen TVs and lake or hill views. Some have sleeper sofas, dining tables and balconies. Suites have additional living areas and furnished balconies. A resort fee covers Wi-Fi, parking and 24-hour gym access. There's also a full-service spa and a restaurant with lake views, plus 3 outdoor pools and a hot tub. Off Highway 281, this charming bed-and-breakfast in a 2-story house and cottage annexes along a rural roadside area is a mile from the Lyndon B. Johnson National Historical Park Visitor Center and Park Headquarters. Homey, rustic suites come with Wi-Fi access and satellite TV, plus coffeemakers, microwaves and minifridges. All offer sitting areas and/or patios; upgraded rooms add whirlpool tubs. A breakfast buffet is provided. There's a shared porch, a cottage-style garden and an on-site farm.